Griffin Remedy Scalp Therapy Conditioner is formulated with Tea Tree Oil and Aloe Vera Extract, which soothe the scalp while moisturizing and nourishing hair. Tea Tree Oil, a natural anti-fungal, helps reduce flaking while moisturizing the scalp. Suggested Use: Massage conditioner through clean, damp hair, leave on for 1-2 minutes, then rinse. 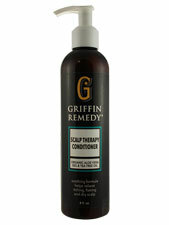 For best results, start with Griffin remedy Scalp Therapy Shampoo.